Beautiful, passionate and very musical piano accompaniments for all major, harmonic and melodic minor scales. These are excellent for flute warmups, flute students who don't like scales, and you can, in one minute, right click and save them to your computer as mp3s or to burn to CD. Thank you to the smart person at "Your Accompanist" (affordable singer's mp3 accompaniment tracks) for letting me know about the free scale accompaniment mp3s for flutists! Can be used for myriad scale patterns. 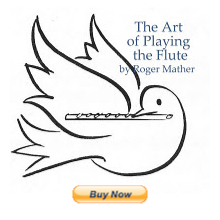 Flute major/minor scale backing tracks link (click here).